Tony Chiaramonte lost 19 lbs. in 90 days with P90X3. 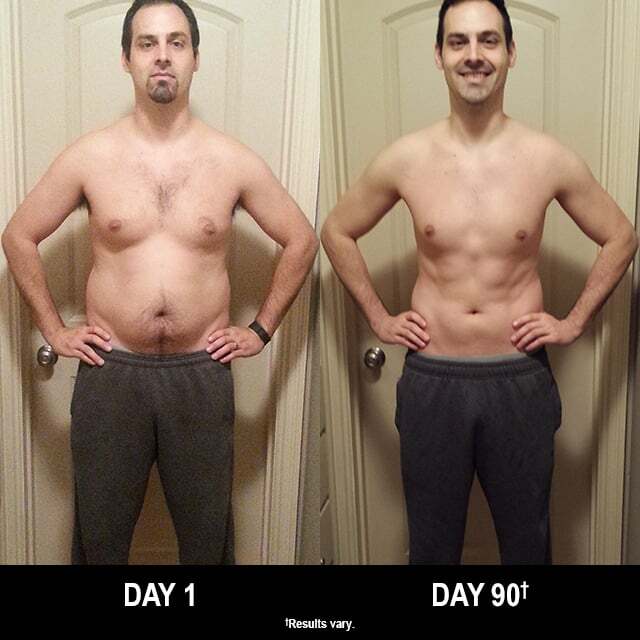 He entered his results into the Beachbody Challenge, and won the $500 Daily Prize for November 10th! Before I started P90X3, I was eating whatever I wanted, which included a lot of sugar. It was making me lethargic throughout the day, and I was hovering around the 200-pound mark. My dad has had four heart attacks and my grandpa died of a heart attack. Neither was really overweight, so this is something that runs in the family. I have four kids and I want to make sure I do everything I can in my power to make sure I live a full life and give them all of myself while I’m here. Eating sugar was my greatest obstacle. Also, getting up in the morning was hard at first. Now that I am used to it, I wouldn’t miss it! Also, eating small meals throughout the day didn’t allow me to get hungry so when there was that cake or pie at work, I wasn’t interested because I had just eaten some edamame or some veggies and hummus. I like that it’s simple. The workouts are shorter (30 minutes), and there’s a large variety. I love the Isometrix workout! I lost 22 pounds. Body fat is down 4 percent. I am able to eat a lot of clean food and still lose weight. I am enjoying eating cleanly and workouts enough that I’ll continue like this going forward!